In Mathnasium’s middle school program, students master computation and problem solving with rational numbers, i.e., fractions, decimals, and percents, as part of the process of algebra readiness—preparing for first-year algebra. This creates a solid mathematical foundation for future subjects such as geometry, trigonometry, and pre-calculus. Middle school students engage one to one with our instructors in a unique combination of mental, verbal, visual, tactile, and written exercises. Basic math concepts and skills are blended with a program specifically designed to help students build number sense. This special program shows them how and why the useful number rules they’re learning work so they are able to understand how they can be applied to interesting areas such as computer science, biology, and psychology. Students are evaluated with a written and verbal assessment unique to Mathnasium. 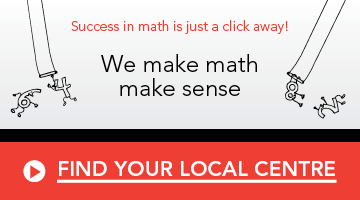 Based on the results, we develop a custom-tailored program designed to close any educational gaps they may have so they can jump ahead when they’re ready for advanced math challenges. Middle school math builds upon elementary math’s foundation and focuses on explaining why mathematical rules work so that children learn and understand the rules, not just memorize them. We also help students understand their homework as part of each session and prepare them for school tests, as well as standardized tests such as high school entrance exams. Many students start middle school with gaps in their mathematical foundation. At Mathnasium, our experienced instructors work with kids to fill in those gaps while still addressing their current needs. Middle school math is often when students see a split in classes, with some kids starting algebra before high school. At Mathnasium, our experienced instructors work with middle school kids to help them forge ahead in math classes. Students are given a “preview” of math concepts and lessons that they will encounter in future classes to help prepare them for high school, university, and beyond. How does the Mathnasium Method teach my child? How are my child's math skills? What critical topics are covered at Mathnasium?